A Google Trends search for “BYOD” reveals it is a fairly new term, appearing in news publications for the first time in late 2011. BYOD is one part of a much larger, deeper-rooted trend: The consumerization of IT, which can be traced back to the early 2000s. Around that time, most everyone had a personal computer, which enabled them to work from home after hours – and to realize the benefits of using the devices that they had carefully chosen and were comfortable using, rather than the corporate devices their IT departments had issued them. BYOD and the consumerization of IT continued to grow as devices became cheaper and more connected. Where IT leaders were once solely concerned with reining in all the unapproved devices accessing the corporate network, a recent Intel and readwrite report that shows 49 percent of U.S. 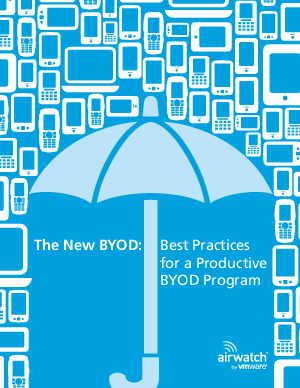 IT managers “strongly agree that BYOD improves worker productivity.” The next era of BYOD has arrived, and IT departments are thinking about it as a strategic value-add rather than a threat that needs to be controlled.